Cotton is one of a number of cellulose fibres (plant fibres) which include linen, tencel and the synthetic fibre, rayon. These fibres can all be dyed using the same dyeing methods. The major difference between cotton and wool dyeing is the dyeing conditions. Alkaline (or caustic) conditions are used for fixing cotton dyes, whereas acid conditions are used for fixing the dye to wool. 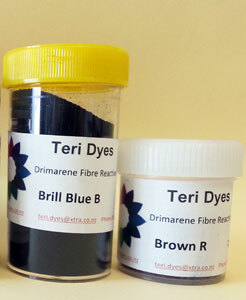 Fibre reactive dyes are generally used for cotton dyeing. Although these are not the only dyes available for cotton, they are the most versatile for craft dyeing. They combine excellent wash and light fast properties with the ability to be used for both hot and cold dyeing techniques. If you would like to download a full guide to dying cotton using Teri Dyes products please go to our Downloads page. To purchase our cotton dyes please visit our store.